Pop Art  an entirely new and defiantly American style of painting and sculpture  was all the rage among the cultural cognoscenti in the turbulent 1960s, and New York City was the unquestioned epicenter of Pop Art. No artist embodies this groundbreaking movement more than Roy Lichtenstein, the only Pop Artist born in the city and whose life and experiences there inspired much of his most popular and iconic work. 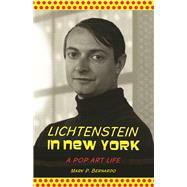 This book looks at Lichtenstein's life through the lens of New York City, taking the reader to the Manhattan that Lichtenstein knew, from the Prohibition era through the postwar era and countercultural revolution to the well-heeled iconoclasm of the 80s and 90s. It is a fascinating biography of a major but sometimes neglected trailblazer of 20th-centruy American art. Mark P. Bernardo is a professional magazine journalist and editor who has written about travel, culture, and luxury lifestyle subjects for Robb Report, Bloomberg Pursuits, Worth, Stuff and Overtime. He was the editor of Smoke for six years and is currently the digital media editor of WatchTime. He is the author of Mad Men’s Manhattan: The Insider’s Guide and Elvis Presley: Memphis, published by Roaring Forties Press. He and his wife live in New York’s Hudson Valley.